Meet Stella – single, divorced mother from Pontyberry and her three children: Luke the car thief, love-struck Emma and whizzkid Ben. Stella’s life is a perpetual whirlwind as she juggles her ironing business, her exes, her kids’ dilemmas and her off-the-wall friends, like Paula the alcoholic undertaker and Big Al the lollipop man, in love with Stella since 1984. In this, the complete STELLA box set, join her on a joyous six-series jou..
Back to Pontyberry in the South Wales Valleys for more laughs with hard-working, 40-something, single mum Stella and her unusual collection of family and friends. Stella is pregnant and worried: does she really love Sean and is it even his baby? And son Luke is thousands of miles away in Canada but for how long? Still, there's plenty happening in town to take her mind off things: Emma's trying her best to do the marriage thing but husba..
All ten episodes from the first series of the British comedy drama written by and starring Ruth Jones. 40-something single mother Stella (Jones) spends her time in Pontyberry looking after her children and earning money by ironing for the locals. Her eldest son, Luke (Craig Gallivan), is soon to be released from prison and she is worried about how he will readjust to life in the community. Her daughter, Emma (Catrin Stewart), is dating .. The first two series of the British comedy drama written by and starring Ruth Jones. 40-something single mother Stella (Jones) spends her time in Pontyberry looking after her children and earning money by ironing for the locals. Her eldest son, Luke (Craig Gallivan), is soon to be released from prison and she is worried about how he will readjust to life in the community. Her daughter, Emma (Catrin Stewart), is dating Sunil (Rory Girvan.. The first three series of the British comedy drama set in the fictional Welsh town of Pontyberry written by and starring Ruth Jones. Series one finds 40-something single mother Stella (Jones) spending her time looking after her children and earning money by ironing for the locals. Her eldest son, Luke (Craig Gallivan), is soon to be released from prison and she is worried about how he will readjust to life in the community; her daughter..
All 51 episodes from the first five series of the British comedy drama set in the fictional Welsh town of Pontyberry written by and starring Ruth Jones. Series one finds 40-something single mother Stella (Jones) spending her time looking after her children and earning money by ironing for the locals. Her eldest son, Luke (Craig Gallivan), is soon to be released from prison and she is worried about how he will readjust to life in the com..
Stella is a 10 part comedy-drama for Sky 1 set in the Welsh Valleys with Ruth Jones (co-writer and co-star of the multi-award winning Gavin andStacey) in the title role. After her love life rollercoaster ride of series 2, Stella has renounced men and embarked on a new nursing career. With all her children and grandchildren plus a dog now living at home, Stella's house is bursting at the seams. Just as she likes it! But an encounter with..
All ten episodes from the fourth series of the British comedy drama set in the fictional Welsh town of Pontyberry written by and starring Ruth Jones. In this series, Stella (Jones) continues her romance with neighbour Michael (Patrick Baladi) but problems arise when he decides to run his solicitors' firm from her house. 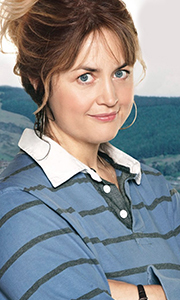 With her home increasingly cramped, Stella pursues her dream of nursing but encounters more relationship problems when..
All ten episodes from the fifth series of the British comedy drama set in the fictional Welsh town of Pontyberry written by and starring Ruth Jones. In this series, with Michael (Patrick Baladi) working in London, Stella (Jones) takes on the role of caring for the heavily pregnant Beyoncé (Remy Beasley), but how will Michael react when he finds out? Meanwhile, Jag (Pal Aron) takes over as landlord of the Frisky Fox, the town hosts its o..